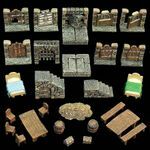 Game Tiles Dungeon Dressing Pack is made of "Dwarvenite" and expands the Games Tiles Base Set. This pack was initially available as an Add-On pack to the Game Tiles Kickstarter. The pack comes in both painted and unpainted versions.